With the recent elections of Pope Benedict XVI and Pope Francis, the world witnessed the pomp and honor of the Swiss Guard, the "Pope's Army." 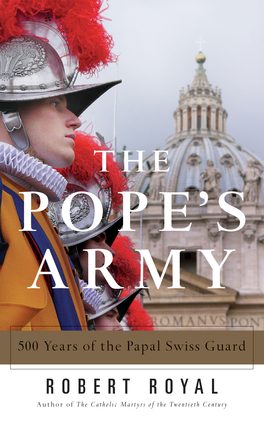 Now bestselling author Robert Royal takes us through the colorful 500-year history of the military guard that has witnessed every major Vatican event for half a millennium. Topics include the guard's origins, the Medici Popes, the sack of Rome, the Napoleonic War, the unification of Italy, the Pope's imprisonment; World Wars I and II; and the Nazi occupation of Rome. Perfect for those seeking a greater understanding of the Vatican's inner-workings, Robert Royal's bestselling book on the Swiss Guard is now available in paperback.